In 1888, Milwaukee’s Jos. 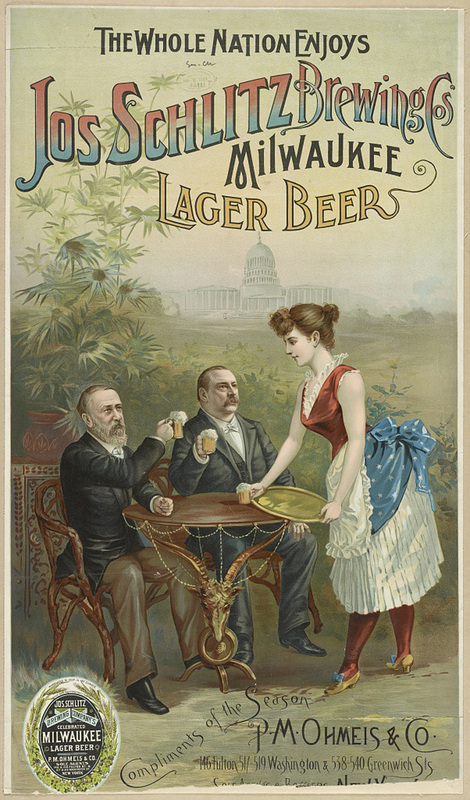 Schlitz Brewing Company distributed this 15 x 26-inch chromolithograph poster. Courtesy Library of Congress Prints and Photographs Division, LC-DIG-pga-04220 (digital file from original print). Far be it from me to argue with the Library of Congress, but its caption is obviously wrong and kind of weird. “What Joseph Schlitz might have looked like had he been alive at the time.” Really? I guess nothing says, “Drink up!” like an artificially aged dead beer baron. This broadsheet was printed in 1888, a presidential election year. The man at the left in the poster is the Republican candidate, Benjamin Harrison. The man in the center of the poster is his opponent, the Democrat incumbent president Grover Cleveland. The Schlitz Brewing Co. was making the humorous point that good beer is one thing everyone can agree on. 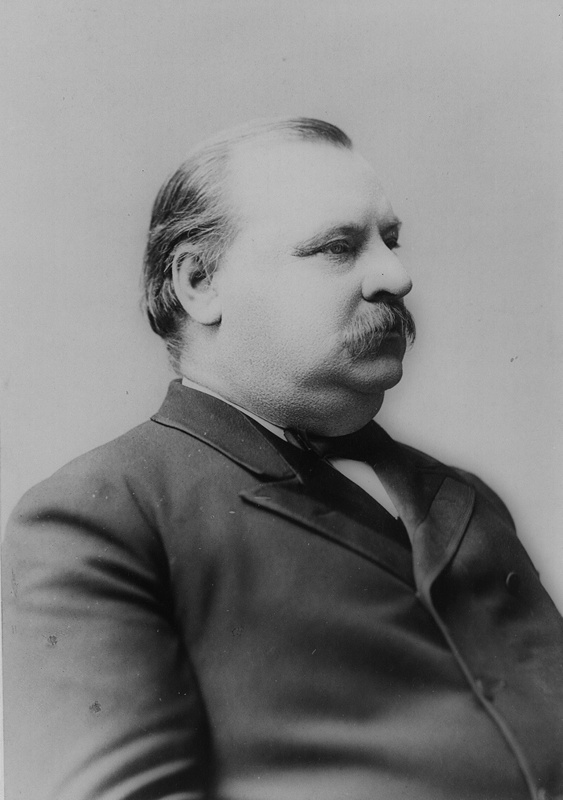 Cleveland narrowly won the popular vote that year but Harrison won the electoral college by a substantial majority (233 to 168 votes) and consequently became the 23rd president of the United States. But don′t shed any tears for Cleveland. He served as president twice. 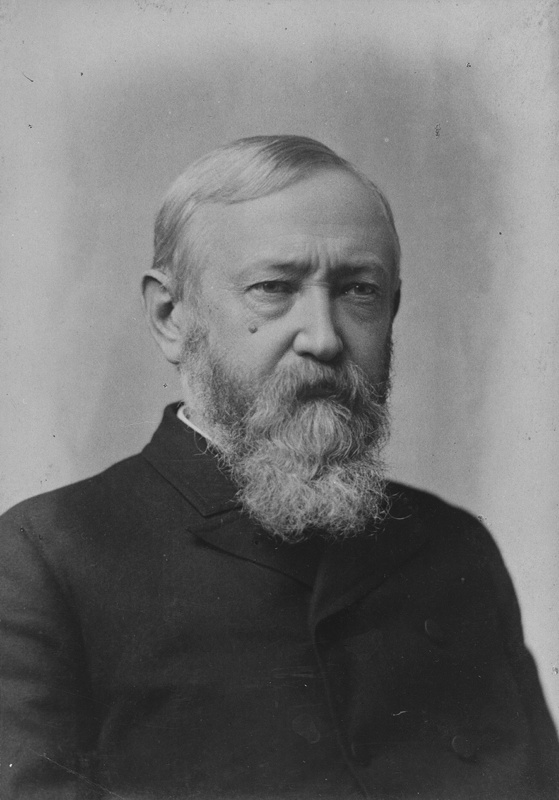 He defeated Harrison four years later, making Cleveland both the 22nd and 24th president – the only one to serve non-consecutive terms in office. You can win a lot of barroom bets knowing that bit of trivia. The idea of these two hanging out and having a few beverages together is not so far fetched. It rained at Harrison′s inauguration. Outgoing President Cleveland not only attended the ceremony, he held an umbrella over Harrison’s head while he took the oath of office.